Last week, Sharath Shroff and I had a chance to sit down with Sprint’s Trevor Van Normal of Handset Product Marketing and Caroline Semerdjian from Corporate Communications. We were lucky enough to get an early hands-on preview of the Epic 4G and had managed to get some questions answered. Much like the Blockbuster App on the Droid X (and Droid 2), Samsung’s pre-installed Media Hub application brings movies to the Epic over the air. The service offers the option to both purchase and rent movies at fairly reasonable prices. Rentals were as affordable as $3 for a 24 hour licence and pricing for purchases reach up to $20. 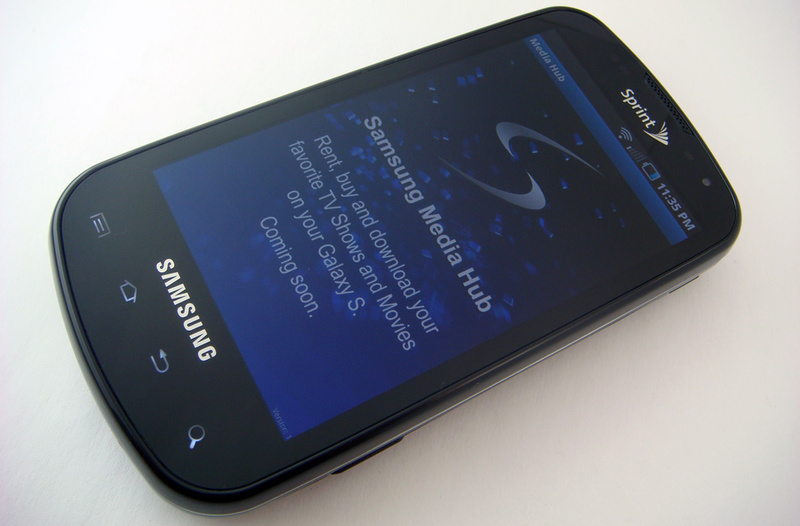 Unlike Blockbuster’s app, the Samsung Media Hub offers progressive viewing, meaning that you can begin watching a show while it is still downloading. There are indicators to show the amount downloaded and the current position of playback. While the progressive viewing feature may lead some to believe that it has advantageous over Netflix and Hulu technologies, which require a constant internet connection, there are still a few drawbacks. Even if a movie is completely downloaded onto the phone’s storage, the DRM technology requires momentary internet access to initiate playback of a file. This means if you are in a dead zone, in another country, or on a plane, the Samsung Media Hub movies won’t work even if already saved. While the HTC EVO 4G already received the long-awaited Froyo update earlier this month, the Epic 4G will ship with v2.1 on August 31st. According the Sprint representatives we spoke with, they expect a 7-8 week turn around time to release the update. That’s also the same amount of time it took Sprint, collaborating with HTC, to distribute the update for the EVO. Sprint also stated that software updates spend nearly 30 days in their test labs to ensure a bug free product. And of course, when it’s ready, Sprint will push it to devices over the air. They are working closely with Samsung to ensure a fast release. While I walked into our meeting assuming that the Epic 4G was running Touch Wiz 3.0 interface, which appears on other Samsung devices, it turns out that this smart phone is running something older. According to Trevor Van Norman, the Touch Wiz interface isn’t the older v2.0, but he also said it wasn’t v3.0 either. It’s apparently an “in between version,” which he labeled v2.5. I asked whether the upcoming Froyo update would include Samsung’s new Touch Wiz 3.0 interface, but he wasn’t entirely sure (or wasn’t allowed to tell us). Despite the lack of the latest Touch Wiz interface, according to Sprint, the interface is faster and less obtrusive compared to HTC Sense. As some who’s used both a stock install of Android as well as the EVO, which sports HTC Sense, there are quite a few differences. A less integrated interface, like Touch Wiz, might just be something certain customers may prefer due to a more-simplistic nature anyways. Since the Epic 4G sports a front-facing camera like the HTC EVO 4G, we wanted to double-check cross-device compatibility for video calls. We were glad to hear that calls placed with the pre-installed Qik app would work perfectly across both devices whether on a 3G, 4G, or WiFi network. While that’s great, I should note that the Epic 4G only has a 0.3 megapixel front facing camera versus the 1.3 megapixel camera featured on the EVO 4G. 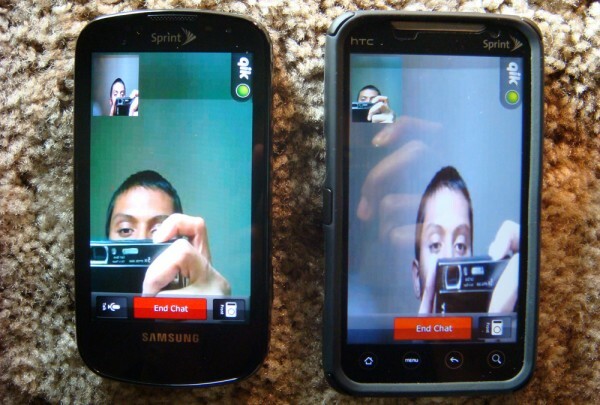 We’ll be publishing a video demo of video calls in action, so stick around for that. But as a heads up, video quality coming from the EVO 4G looked significantly clearer and more colorful than the front-facing camera on the Epic 4G. Also, we don’t know if this is a temporary bug, but video from the Epic 4G was also “squished” as you can see in the image above. Hopefully, a “Qik for Epic 4G” app in the Android Marketplace will fix that. 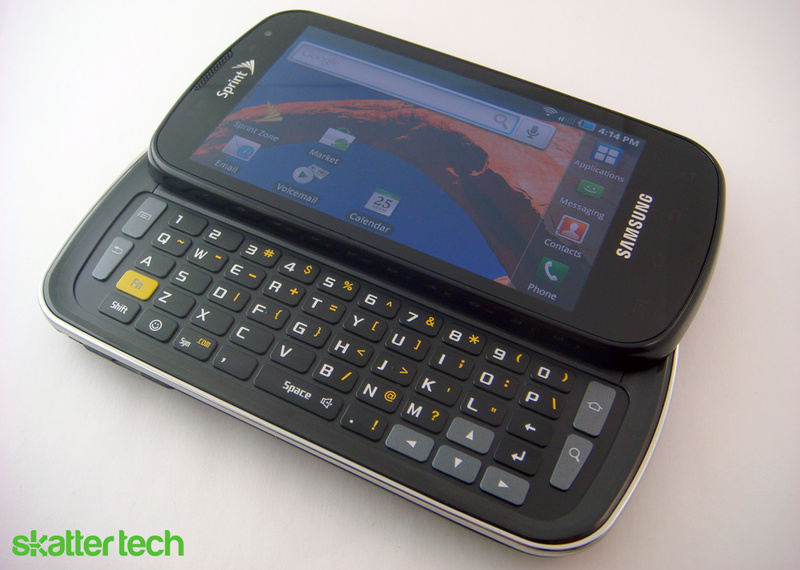 Like the HTC EVO 4G, the Samsung Epic 4G also sports an integrated mobile hotspot. Whether on a 3G or 4G network, the smart phone will offer the ability to share a WiFi internet connection with up to 5 devices. We asked Sprint why this phone didn’t support up to 8 users like the EVO and received an interesting response. According to the representative, Sprint’s research has apparently shown that the majority of their customers who subscribe to the $30 / month tethering data plan only use the hotspot with a single device at a time. And the number of customers that use it with two, three, or more devices exponentially decreases. While that’s no excuse for limiting features, I’m guessing it won’t be a problem for most customers either. Epic 4G isn’t locked down to the 30 FPS limit like the EVO 4G. A video game he demonstrated to us reached over 60 FPS and remained over 50 FPS for the most part. San Francisco Bay Area will have 4G by the end of this year. Some people in the area may get signal already due to extensive tests being conducted in the area. There is a currently a 1 Mbps upload speed cap on 4G networks. 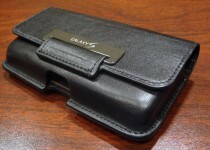 Sprint is working with Clearwire to, hopefully, lift the cap in the near future. Also another odd finding? The 4G radio won’t stay on when WiFi is on. It’s one or the other. The EVO allows for both radios to be on simultaneously. Sprint also showed off 3 official Galaxy S branded accessories for the Epic 4G that will go on sale through their retail and online stores. 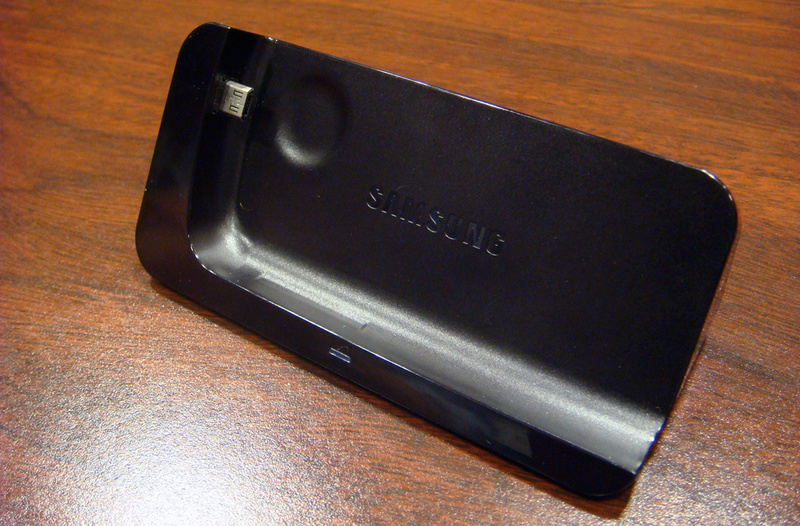 The first was a desk stand which charges the phone with a microUSB port. There’s a line out audio jack in the back for connecting to a set of speakers. 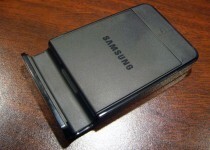 Sprint will also offer an external Samsung battery pack charger. While you can recharge a second battery by swapping it out with the one in the phone, this can help speed up the process for heavy users. 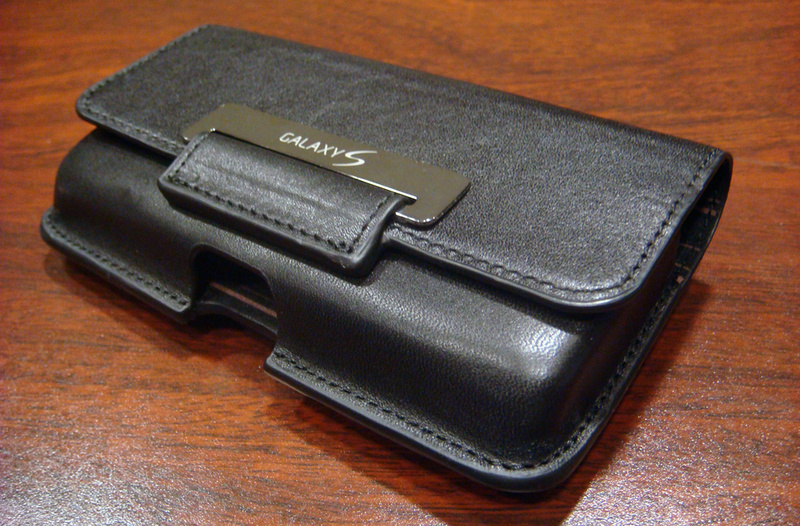 Finally, there was also a neat little leather holster case for the phone. There’s not much more to say about the latter, but it’s a welcome option for those who want an non-3rd-party case. The latest specification sheet from Sprint says 1GB ROM and 512 MB RAM. The representative I mention in this article also confirmed it. However, I just opened up the phone storage menu. It says 447 MB remaining of available internal storage. I haven’t installed any applications on it just yet. So this is odd. I’ll let you know as I get more information. There is some sort of discrepancy. Just updated the article with an official response Sprint provided. It does indeed have 1GB of ROM. (Not 512 MB.) They are fixing the developers page to reflect the correct amount soon. Thanks Sahas for the update. Any news on the FM radio receiver if it exists in the EPIC? I don’t care if they do not include the radio app but I at least hope that the receiver is included. BTW why did it have only 400MB left in the ROM? Have they preloaded lot of videos in the device? Even Engadget posted that it had only 400MB left. No FM Radio app, I am almost entirely sure they would have included an app for it if it had the hardware to support that feature. Which likely means no FM tuner inside. As for the 400 MB left? No clue why. My phone came with no videos or music pre-loaded. I hadn’t installed any apps from the marketplace on my own at that point either. I don’t have a solid answer for that unfortunately. Well, I guess I have to use Pandora or something. Not a deal breaker anyway. You did not mention anything about GPS in your article. I just read Samsung’s reply about GPS on Engadget. Samsung has replied that GPS on EPIC 4G works fine and Vibrant/Captivate will get the fix next month. Did it work fine on your test device ? Also please confirm if there is a FM radio support. I do not see an FM Radio App in here, however a spec sheet I have says it does. This is also odd. Our guy who made the infographic wrote that it has it as well. Thanks for the reply. Do update and let me know if you find more info. On both FM and internal storage. Thanks. Kams, theres is an app called Tunein which you can get on the market app and its the best fm radio app i have ever come across and i have tried plenty of them and no luck whatsoever, and the best part is its absolutely free. trust me you will love it. There is in fact a great fm radio app called Tunein and its free. its actually the best radio app i have come acroos and i use it all the time and i have tried plenty of them but had to unistall it cause some of them were exclively for certain areas and most just were very crappy. so go to the market app and search for it. i’m sure you guys will love it. I’ve spoken with representatives from Sprint, Radio Shack, and Best Buy. I was speaking with them about what phone I should get, the Htc Evo, or the Samsung Epic 4G. All 3 store representatives said the same answer, while the HTC Evo has a better camera and is slightly larger the Epic is a better phone and faster. So they all told me to go with the Epic. What do you think? You can’t go by what the reps say. People by nature are like kids. Anytime something new comes out we get excited and say that’s the best thing. When the next phone comes out they’ll say that’s the best even if it’s the worse. You just have to play with them yourself and decide. The specs of the phones are really pretty similar, so don’t let that decide for you. The biggest difference is that the EVO uses HTC’s Sense UI, and the Epic has Samsung’s TouchWiz UI. This means both phones have a different look & feel, in addition to different internal apps (music, contacts, calendar, & other pre-loaded stuff). Like Guyver said, I’d go to a store and test it out for a good amount of time. Software is what’s most important, so choose whichever you feel is better in that regard. Ok well truth is htc evo is a tad bit faster then the Epic 4G due to latest update of 2.2 Froyo both are amazing phones but tht was there opinion in my opinion i rather not have a physical keyboard do to higher risk of damage and laggyness. The evo is a much more reliable phone in my opinion apart from some battery life issues (rarely) the phone itself is great great camera great style just an all around good phone. So if you want a more reliable faster smoother and more customized interface i suggest the evo much better phone. Epic has the 6 axis sensor, which will become a standard feature in all phone launched next year. Since the next year will be all about games, with googles big push into the area, go with the Epic. It has a powerful graphics processor. I on the other hand am waiting for clearwire to launch these phone in a few months, their plans could be a little more attractive. My PS3 has a sixaxis controller. I’m on the Xbox 360 most of the time. Sixaxis is not the future. It’s the past. Tech like project natal is the future. I wouldn’t get the Epic only because its made by Samsung, their track record is awful with Android (look at Moment and Intercept phones in particular). AND the new GalaxyS phones have a GPS issue now as well (so did and does still the Moment). Overall, I’ll keep my Evo because HTC knows what they are doing and although every phone has bugs (including the Evo), HTC has only very few and they aren’t show stoppers like lack of accurate GPS that may or may not be fixed in September. I use GPS all the time. Plus Touch Wiz is UGLY, I’d much rather have stock Froyo over that. I will give it to the Epic though, it does have some excellent hardware (hummingbird processor, no FPS lock, AMOLED screen) but Samsung and Android aren’t a well oiled machine yet. Can you please confirm if the music player on the Epic also has the sound equalizer? I ask because I understand the Epic music player is different than the Captivate and Vibrant. It is a different music player. It doesn’t appear to have an equalizer. Thank you for the update. That’s really sad that the phone is charged with a premium over the other Samsung S phones with some capabilities removed. Guyver, you have hit the nail obliquely on the head. You are correct that vision systems are the future, but the reason Natal and others work so well, is because they have a fixed position. For handheld cameras to do as well, they will need to be able to calculate their precise location/orientation, and that is where the six axis gyroscope comes into play. Certainly it will be used as a game controller as well, but for smooth augmented reality, the system needs a six axis gyro. I’m not in any way affiliated with any company operating in the mobile domain. Sprint ruins every phone it gets its hands on. 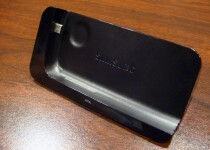 Case in point, HTC Hero. They came up with a design totally different than the Euro Hero and it ended up with a stupid button pad which combined with HTC cutting corners with faulty seals on the LCD and many of the units developed leaks for dust to get inside. I have a ton of dust under mine. My previous phone was the original Instinct and that was a complete disaster. One positive about Samsung IMHO, they make better phones which work as a phone than HTC. The Hero is quite marginal in that department also.